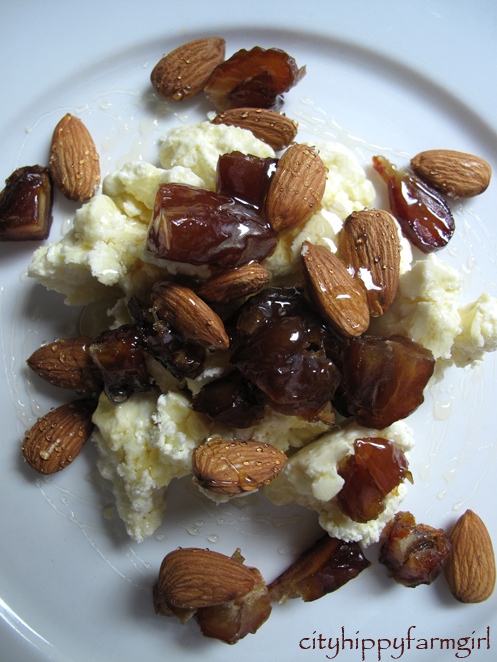 This entry was posted in Food Glorious Food and tagged dairy, food, home made, homogenised, labneh, milk, quick and easy, recipes, ricotta, slow food, sydney, unhomogenised by cityhippyfarmgirl. Bookmark the permalink. Thank you for a great lesson. I had no idea how to make ricotta. When I was growing up, my mother used to buy milk and cream from a man who delivered straight from his dairy. He would arrive with milk in a bucket and pour it into containers Mum had ready. He would also spoon cream into a dish for her. It was so delicious. Of course, health restrictions put a stop to that eventually. I also lived for a while on a dairy farm when my son was a boy, so he also got to know what fresh milk was about. Lucky us! Definitely lucky you Debra. The hoo hah regarding raw milk in this country makes memories like yours just that. Lovely memories. For a little while when I was small we lived on a farm and dad would milk a cow in the morning. I always hated it still warm from the udder. Now the idea would be quite novel. Dead easy shayray. If you like it softer, keep more of the whey and you might like to add a little salt? I didn’t though. Hey Brydie, here’s another group to check out http://forgingfromage.blogspot.com/ some of whose members are bakers as well – I would love to join in, my efforts so far have been quite limited. Your ricotta sounds fabulous. I haven’t had raw milk in years, but I know it is available by mail order in the UK and there is discussion here and there on health benefits vs risks, the dairy industry and the production of surplus calves etc…. I’m not big on cream, though I do love cheese! I’ve enjoyed reading this post! It’s also funny how the raw milk regulations can be so different around the world. From one country it being highly illegal, to another being the only way to drink it if you are serious about your milk. Thanks to yours and Gavin’s ricotta posts, it made it very easy to cross reference 🙂 Got to love the internet eh. Nice one Brydie. It is great to see that you tried until you were successful. So many people would have given up, so kudos to you! I simply love getting the cream off the top of the milk. Yum. Have you ever tried baking the ricotta once it is made? We add some crushed garlic and some herbs from the garden, pour into a ramekin and bake. I have read about people making ricotta with lemon juice bit I never seemed to be able to get curds and whey to separate. I use vinegar too. Oh yum, that would be delicious. I’ve had baked ricotta on my list to make for a few years now, and then usually get side tracked and forget. Will definitely give it a crack. I am going to try and make some…all the recipes I have previously seen have been with cheese cultures…I am not about to go out and buy that right now, but I have milk, I have vinegar, and I want lasagna! Mmmm, I’m thinking I could have your lunch for my breakfast right now! You’re absolutely right about the disassociation we have with food production and the real commitment that has to be made to rediscover old, ahem, wheys. What an important post, Brydie. Thank you. Your more than welcome Wendy. What a great post, Brydie! 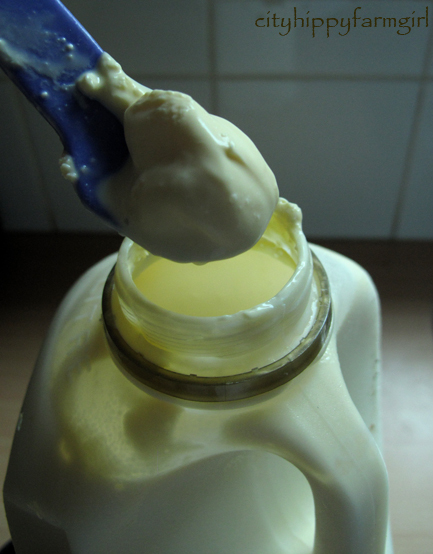 I have very fond memories of unhomogenised milk from my childhood, when we used to fight over who would get the cream on the top for their cereal. And you are right about making some of the simple dairy products from scratch. I make labneh and just love it! As does anyone I can bear to share it with! I agree Brydie. Fabulous post! We aways try to buy the unhomogenised milk, also organic if possible, for those very reasons you state. It just never fails to amaze and sadden me what “they” put our food through before we are able to purchase it. It also saddens me a lot to think how many of us don’t have an inkling what those processes actually are and how detrimental they can be to our health.! I’ve just finished some yoghurt that I’d made myself, and even though it ended up more of a drink consistency than it should have, I thoroughly enjoyed eating something that I’d made myself. I used Jalna as the culture start, but think I’ll get a small container of another from our local health shop next time. They sell some great organic foods/groceries, including Cleo’s milk. Might even get myself some of that for my next batch of yoghurt, but at almost $8 for 2lt, it’s not something I buy as often as I’d like. Think I might have to bookmark this page for your recipe and try that very soon too, coz I’m loving the look of your lunch and could go for some of that! I did make it once many years ago, but now can’t remember the results! I used to make a lot of things that I don’t now. sigh…. Might be time for me to get back on board. Cleo’s milk I was just trying to read about, info is sketchy and out of date from what I found, and not to be found in my area…will do some investigating as I’m curious now! When you buy it is it labeled as raw milk? Bath milk? Thanks for that info Brydie. I’ll try it next time, coz I’ve already eaten it all! :)) I think I might have had a bit of a problem with getting to the correct heat. Cleo’s has to be labeled as a cosmetic product due to the regs on milk these days, but I did find this page, http://www.angelfire.com/folk/rawmilk/, with a little info and the address etc of the farm it comes from. I’m not sure it does actually get down as far as you are, but don’t quote me! (Are you in Sydney? It was going only as far as northern NSW, but that may have changed now)Their farm is in Gympie up here in Qld, and I did hear once that they have to ship it over the border and back up here to sell it, but can’t remember why now! Sorry. Or even if they still do it. If you could contact them they may even be able to tell you if any is available near you. Also found this page from a forum and comment #16 has listed some places that sold Cleo’s milk, but as you say it is out of date as this was 2007, and you may have already seen this. Lismore: Cleopatra’s Bath Milk is for sale at Fundamentals Food shop. Sydney: Cleopatra’s Bath Milk is now available at some health food shops. Dr Earth’s. Byron Bay: Raw milk is available in Byron Bay if you ask around. Murwillumba: Cleopatra’s Bath Milk is available at the health food shop (Santosh). Bondi Junction: Cleopatra’s bath milk available from Dr Earth. Leichhardt: The Orange Grove Organic Food Markets at Leichhardt (SYDNEY, NSW). Located at Orange Grove Primary School, Balmain Rd, LEICHHARDT. My son loves the Over the moon milk too…and in fact any unhomogenised milk we can find. He gets very exicted if we find some. We were surprised when we were on our big camping trip up north when we started pushing really hard for us to go to a particular town. He had spotted some signboards for a special dairy up there and was convinced he would find really good milk there. And when he has icecream from good milk he swoons. Being dairy intolerant I don’t drink milk (although I do suffer for good cheese, butter and the like, drinking straight milk is never worth suffering for in my book). So now I am curious about the mouse milk. I hope it is not the one I buy for Sam for his daily milk habit. Oh dear. I love that your son has such a dedicated palate for his milk! That’s wonderful. Maybe he’ll be a cheesemaker/icecream maker… and apiarist? Much credit to you too, for exposing him to the different wonders of milk. I love that great big chunk of cream at the top, when the cow is milking at the farm I can’t wait to see the big ‘cream’ basin the morning after they milk the cow. I’ve only ever watched this process but its kinda wonderous isn’t it, I imagine with your sourdough making, you’d really get into this cheese making Brydie. Both of your posts were very informative and interesting. Can you believe that we have our own dairy cows with delicious creamy fresh raw milk every day and I haven’t made ricotta yet! Well thanks to your post I will be more inspired. We do make 2 huge bowls of yogurt every 3rd day, my boys love it in shakes, we only heat the milk until luke warm and then add a starter or we use previous batches (they turn bitter after a while). It’s always nice to know we have our own raw butter, butter milk and creme fraiche. Jeanene how wonderful for you and your family to be able to have that milk access. I’m always amazed at all the fantastic things you can make just with milk. Wow. Homemade ricotta? Wow. I need to read your blog more often!!! And thanks for your comments on my blog, Brydie, I love the support! It’s funny because the chef in the restaurant I’m working in was talking about homemade ricotta yesterday. Now i have to give it a go! Can one make ricotta with homogenised milk, I’ve just come diving back, I want to do this, but I need to investigate milk types. I shall go to the posh supermarket this afternoon and get supplies. And white vinegar is that what I would call in the UK spirit vinegar, the stuff that doesn’t taste of anything much? Help Brydie! Joanna the second and third time I made it here the milk was just regular homogenised milk, and for the white vinegar, just the stuff you get at your fish and chips shop. Ooohh, I hope it worked for you!! Oh so interesting…thank you. Making yoghurt is (still! it’s been on my mind for a little while) something I really want to do. Not drinking or using much milk I’m not familiar with the different types out there, but yoghurt is close to my heart and finding a good brand of that (pot set, no gelatine, no artifical stuff) can certainly be hard! I was sent here by Zeb’s scones to see your ricotta post. I was curious because I’d made some a few days ago. I had a different recipe but loved how it turned out. I can only imagine the unpasteurized milk would have made a much more flavorful ricotta!